These expensive little jerks are so necessary. Cashews are God's gift to vegans. Remember that part in Forrest Gump when Bubba is talking about all the different shrimp dishes when they're in Vietnam? Cashews have a similar versatility: Cashew sour cream, cashew cream cheese, cashew ricotta, cashew yogurt, cashew frosting, cashew cream, cashew milk, cashew Parmesan, cashew cheese, cashew ice cream, cashew creamer, and so forth. But they are expensive. I won't pretend that you will ALWAYS find cashews in my fridge because sometimes, at 6-8.99 a bag, I just ain't doin' it. But you will most always find SOME type of nut in my pantry (except for by pantry I mean refrigerator because NUTS SHOULD BE REFRIGERATED PEOPLE! Don't spend all your money on nuts just for them to sit in your cupboards and go rancid. The same goes for nutritional yeast and seeds!) Walnuts are a much cheaper alternative to cashews and can be perfect for making little energy bites, pesto, lentil and walnut ground 'beef', etc. Basically nuts are incredibly versatile and incredibly nutritious. So go get you some. Oh my sweet, sweet lentils. Also known as Pulses and Legumes, these little red, brown, green, and black circles are also another incredibly versatile food that are insanely affordable and ALWAYS ALWAYS ALWAYS in my pantry! I keep red and green lentils on hand ALWAYS. Did you get that? ALWAYS. We eat lentils just about every day. I'm not even kidding. I throw them in salads, pulse them up with some walnuts to mimic ground beef, whip up a red lentil curry, and so on. One of my favorite things to do at the end of the week when I need to use up produce is roast some veggies, cook up some green lentils, and put together a quick tahini dressing for a hearty and delicious meal. For many of the same reasons as I stated for lentils, I'm always stocked with a variety of grains. My favorites are quinoa and brown and white rice, and lots and lots of oats. I love to add quinoa to salad recipes that need a little extra heartiness, and rice is perfect to have on hand for burrito bowls, stuffed peppers, curry, stir-fry, etc. And oats. Oh, oats. From oatmeal, to homemade granola, to energy bites, to cookies, to being eviscerated into flour. Oats are the real MVP. Both of these are always added to either my smoothie/smoothie bowl or my oatmeal in the morning. Flax aids in digestion and chia seeds are high in omega-3 fatty acids, have tons of antioxidants, plus they provide fiber, iron and calcium. 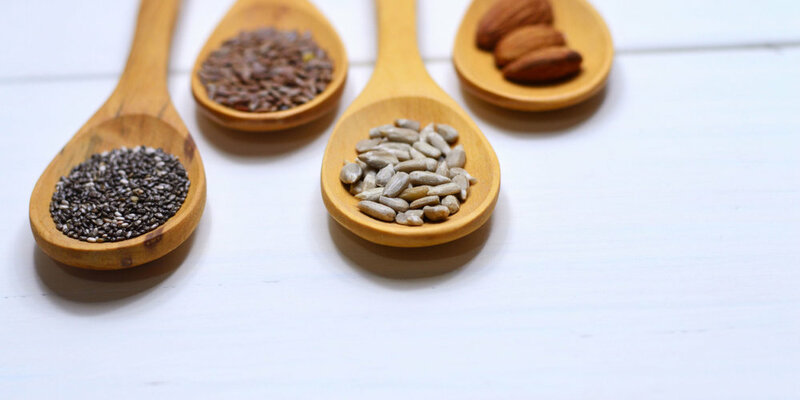 These little itty bitty seeds will make you healthy AF, basically. QUICK TIP ABOUT FLAX SEEDS: You may find whole flax seeds at the grocery store. These are fine to buy but know that for your body to properly digest flax seeds, THEY MUST BE GROUND UP. I buy my flax as 'flax meal' as that takes the step of grinding it out of the process and saves me some time. Dates are just perfection, y'all. They are a natural sweetener that look kind of gross but taste like creamy carmel-y goodness. I love to chop up a few and throw them on my smoothie bowls or in my oatmeal, and I NEVER make a smoothie without actually blending them in because the sweetness they provide is on point. Currently, I'm loving making my own "date paste" which is just dates and water blended into a paste. I use this in recipes that call for pure maple syrup (another staple!). While pure maple syrup is an unrefined sugar, I've found that using date paste takes the nutrition level one step up and tastes just as amazing. Also I could literally just eat it by the spoon. Also I have done that many times if I'm being real here. I don't really have to explain this one do I? Peanut butter is life, y'all. Other favorites: Nutritional Yeast, Hemp Seeds, and Hummus, Tahini, Greens, seasonal fruits and veggies. What are some of your pantry and refrigerator staples!? Drop a comment below and tell me what I'm missing!